Everyone needs a buddy who can support, encourage and comfort them on the journey of life. 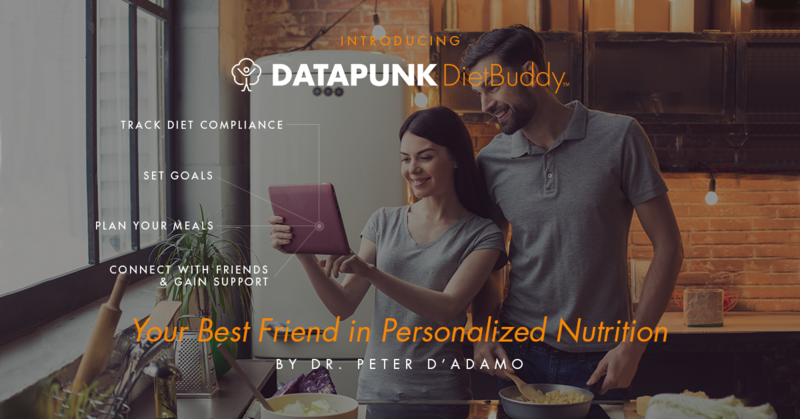 This month, in the spirit of that idea, we are launching Datapunk DietBuddy for people who follow personalized nutrition plans. This program was designed and created by Dr. Peter D’Adamo, as he has always believed we can be more successful with our health and lifestyle plans when we are part of a supportive community. I thought it’d be helpful if I shared a look behind the scenes of DietBuddy, as Peter is my best buddy in life. Peter is a one-of-a kind person, Renaissance man, craftsperson, software engineer, do-it-yourselfer, awesome physician, wonderful partner, loving father, good friend and so much more. It is rare to find this combination of strengths in a person. Oftentimes, we find an individual is good at one thing and terrible at others. The unique strength of Peter is that he has a brilliant mind as well as the ability to put his incredible thoughts into action. This capacity has allowed him to start a number of naturopathic clinics over the years; write best-selling books; co-found a supplement company; create an academic legacy at a university; restore old Volkswagens; fix clocks; install electrical wiring; fix plumbing; have a sixth sense about real estate; teach himself to sail; build beautiful furniture; restore old homes; have an encyclopedic memory of history, music and the arts; co-parent two daughters; and throughout the years, tend to five dogs, a hamster, gerbil, multiple fish, a rabbit and even a baby lobster. On top of all this, he’s got a great sense of humor! All of these things are impressive by the ones or twos, but collectively, they are a testimony to his ability to grow and learn as life — and his roles in life — change. The most enduring (and endearing) qualities of Peter’s are not the “doing ones.” They are the “being ones,” like his capacity to be fully present, loving and kind, a life partner, a best friend, an ardent supporter, a dad and a best buddy. This is where he shines, and it is these qualities that are infused in his programming, his teaching and his patient care as well as his roles as a husband, father, companion and friend. We are so fortunate to have Peter as our visionary, forever pointing us north to new and undiscovered lands. And I am so fortunate to have him as my buddy in life, encouraging me to find greater self-expression in all that I do. As you dig into DietBuddy, you’ll meet Peter in all the intricacies of the coding as well as in its design. In doing so, you’ll get to know him better and understand how his mind works as he encourages us to form naturally occurring support groups that will propel us towards the completion of our health goals. Happy June and here’s to all the buddies in our lives. 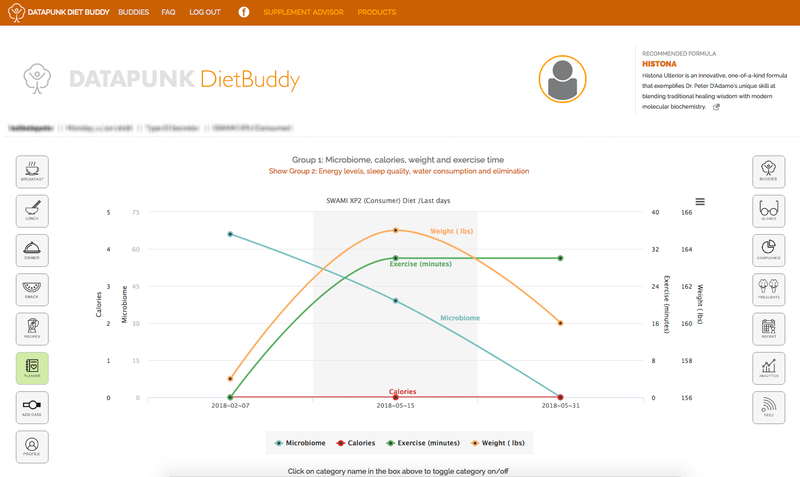 After months of development and testing, I'm excited to be launching my free web-based Datapunk DietBuddy application. 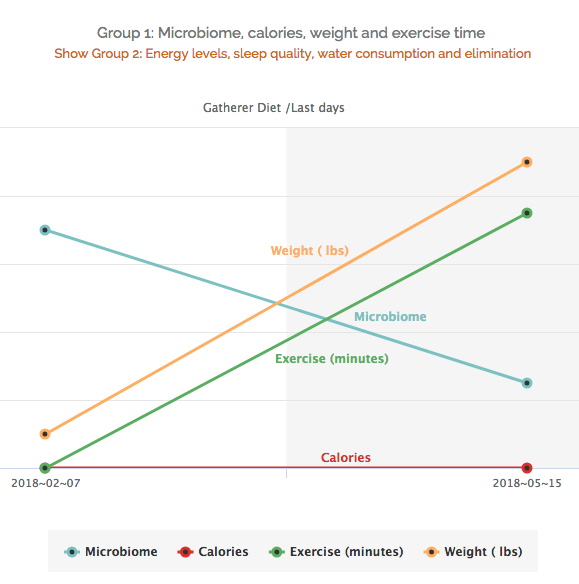 It's a unique way to track and measure adherence to any of my current D'Adamo Diet Systems (Blood Type Diet, GenoType Diet and SWAMI protocol) using a simple and quick 'diet diary' input system. It also allows tracking of simple health data, such as your weight and daily water consumption. Your compliance will be displayed as valuable feedback by a series of informative and visually beautiful infographic pages. 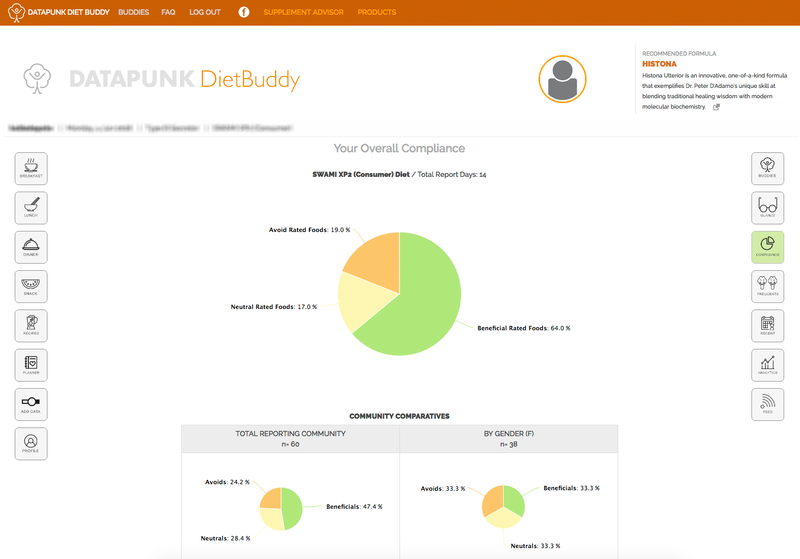 Feedback from early users reported they were surprised at their actual compliance rate once they started diligently tracking food intake through DietBuddy. A graphic pie chart displays user compliance-at-a-glance, even showing diet specific adherence. Using the application is a great way to better self-regulate and optimize the diet journey in ways that were difficult in the past. As as I dug into DietBuddy and watched the success of the users, I realized there were even more things the program could be doing. Once you input your food data into DietBuddy, you will be given not just detailed tracking tools, but a bevy of other options. I have made it so everyone, from the most basic dieter to those seeking more can have an enjoyable and enriching experience. Feel free to just input your foods and get started tracking, but DietBuddy also offers recipe entry and sharing, meal-planning, compliance at a glance, and analytics to name a few. With these tools, you can judge not just how you are doing over time, but how you are doing in comparison to other dieters. That is where DietBuddy truly shines: its ability to bring people together. 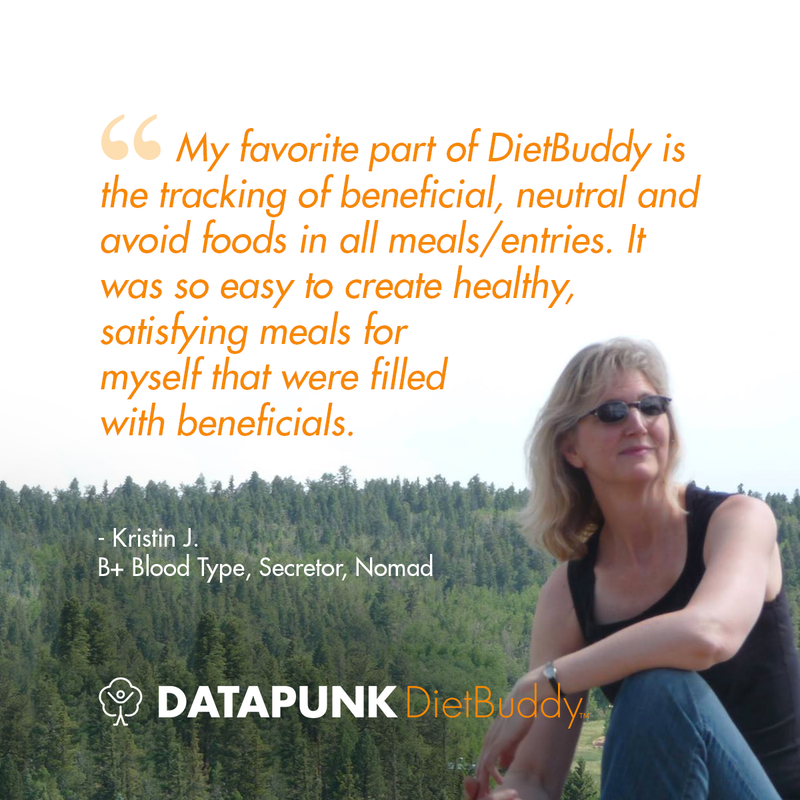 "Datapunk DietBuddy has helped me to better focus my shopping and my plans for my meals. I stop and think before I eat. When making a choice between foods, I always choose the beneficial food. I refer to my SWAMI frequently. DietBuddy has increased my awareness greatly and after 69 days on the program I've noticed an increase in my energy and an improvement in my overall sense of well-being." - Vincie P.
It wouldn’t be DietBuddy without “buddies,” so naturally the social component of the program is one of its most positive attributes. I thought in this social-media-steeped age, it would be nice to allow people to connect with each other. The Buddies feature allows DietBuddy users to do just that, so they can monitor the progress of their friends, give encouragement, and generally just stay in touch throughout their journey to better health. This feature can be used in nearly endless ways. Whether you want to see the foods other Type Bs eat often, get advice from someone else following the plan, or track your compliance in relation to individuals similar to you, connecting with others through DietBuddy offers endless opportunities. The inaugural version of the program is available to use now and is already feature-rich and robust. Although the program is very much live and powerful in its current state, I see future refinements, such as the ability to set very specific goals, like increasing the consumption of Omega-3 Oil or minimizing inflammatory lectins. Since beta testing, I have added the ability to input complex foods and will, between my other obligations, be polishing and adjusting the program with even more exciting features whenever possible. I have started a private Facebook group that I'm a part of to support DietBuddy. The group is a great place to ask questions about the program, meet “buddies” to add within the program, and share your own experience with DietBuddy. And speaking of support, be sure to check out the FAQ tab within the program for user guides and a demo video. The Blood Type Diet community has always been strong and I am excited to see how well everyone bonds together and helps one another with DietBuddy. 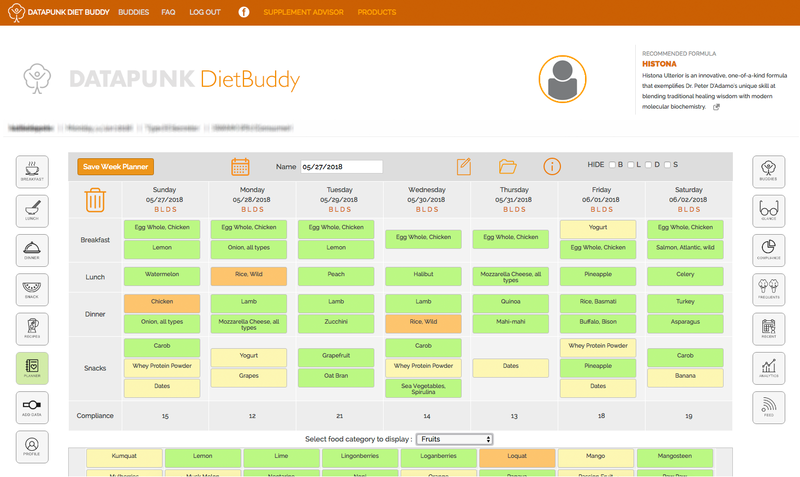 DietBuddy is optimized for desktop, laptops, and tablets. While it can be adjusted to the small screen of a smart phone, I have focused more on tailoring DietBuddy’s usability for larger screens at this time. Live Cell is a product Dr. D'Adamo himself doesn't go one day without. 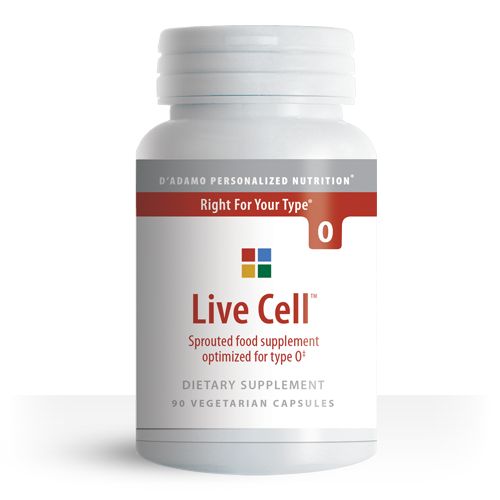 Each capsule of Live Cell is packed with healthy sprouts from various blood type appropriate vegetables and legumes. By capturing the freshness of these sprouts in supplement form, Live Cell is able to provide the highest concentration of vitamins, minerals, proteins, enzymes and phytonutrients possible. The actual plants these sprouts would mature into actually contain less vitamins and minerals than the sprouted form, making this the most efficient way to get the nutrients that are so commonly absent from the average diet. Live Cell is available in personalized versions for each blood type so that each bottle is free of avoids and packed with the best beneficial options for your type. "Live Cell was a lifesaver for me and my family. Eating enough vegetables has always been an issue in my household, and Live Cell makes it easy to get the nutrients we need, especially when we are on the go." Live Cell O caps contain sprouts from onion, broccoli, okra and adzuki beans as well as pomegranate, parsley and larch arabinogalactan. Live Cell A caps contain sprouts from soy, onion, broccoli, fennel, adzuki beans, alfalfa and mustard as well as larch arabinogalactan. Live Cell B/AB caps contain sprouts from onion, oat, broccoli, brussels sprouts and okra as well as watermelon, parsley and larch arabinogalactan. I used DietBuddy to help lose a few stubborn pounds I had gained during menopause. I found the app to be very user-friendly and easy to understand. The tutorials were extremely helpful and enhanced my understanding of how best to use DietBuddy to meet my health goals. I used the calorie counter option. It was quite eye opening to see how many calories were in a typical meal and how to create portion sizes that would help with weight loss. 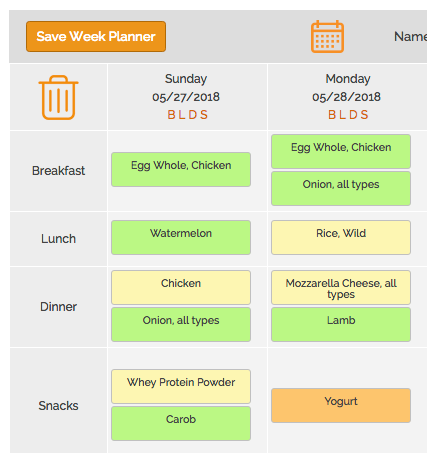 My favorite part of DietBuddy is the tracking of beneficial, neutral and avoid foods in all meals/entries. It was so easy to create healthy, satisfying meals for myself that were filled with beneficials. So not only did I easily meet my weight loss goals after 60 days of using DietBuddy, but my focus on having a high percentage of beneficials in every meal produced other tangible health benefits as well. I noticed an increase in energy, more ease in handling stress and more fluidity and suppleness in several joints that had been plagued with inflammation for years. I highly recommend DietBuddy as an excellent tool to meet your health and lifestyle goals! Kelly Calabrese, a board-certified clinical nutritionist from Colorado, shared the importance of blood type in her local paper, the New Falcon Herald. Bret Baier from Fox News dropped nearly 50 pounds in only 7 months by following the Blood Type Diet. The journalist began the BTD after becoming increasingly concerned with high cholesterol and his overall health. A new study found that Blood Type A individuals experience far more aggressive effects from the E. coli bacteria strain, proving just how impactful the specificity of blood type is. Successful model Hailey Baldwin, featured in this month's edition of Italy's Elle Magazine, has been a long time follower of the Blood Type Diet, as noted in this recent article from Celebrity Health & Fitness. 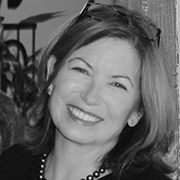 "She's also a big believer in naturopath Peter J. D'Adamo's Blood Type Diet. It's a favorite of a number of fashion models, including Australian model Elise Taylor." Cod is an across the board beneficial, even for every secretor type! Why not take advantage of the health benefits? 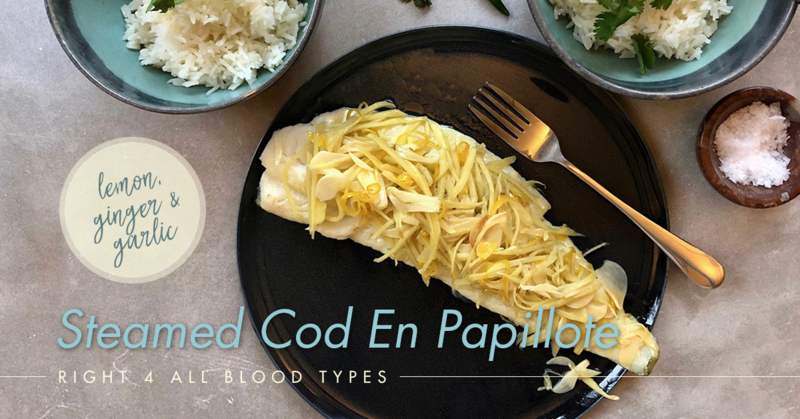 This traditional French preparation “en papillote” or “in parchment” is a great way to capture all the flavors of the fish and infuse it with herbaceous vibrance from ginger and garlic. Preheat your oven to 350º F.
In a small mixing bowl, mix together the garlic, ginger and lemon zest with a pinch of salt and allow it to rest for a couple of minutes. Add the olive oil and mix well. Place the cod fillet skin side down (if it has skin) on a large sheet of parchment paper. Spoon the ginger and garlic mixture over the fish. Fold the paper in half over the fish so edges meet. Create a seam by folding the edge onto itself a few times. Fold the edges on each side of the fish at an angle to block any liquid from leaking through. Place the parchment paper in a layer of aluminum foil and seal. Place the fish in the oven and bake for 20 minutes. Garnish with cilantro and serve! Serving suggestions: This cod pairs perfectly with white or brown rice and steamed vegetables. Pick the ones best for your blood type and enjoy!